Matsyendra...good thing he was thrown out by his parents? By now you may have noticed I’m interested in a focused direction for our time together in class. This week we will be exploring postures that compliment getting into and going deeper in Matsyendra’s series of poses. Some may be very familiar and practiced often but then there are the variations that take some stronger investigation. 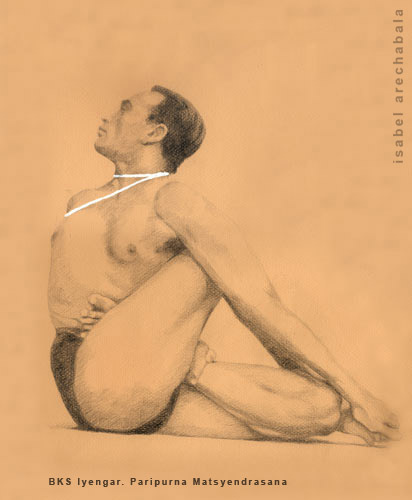 Above we see BKS Iyengar in Paripurna Matsyendrasana. 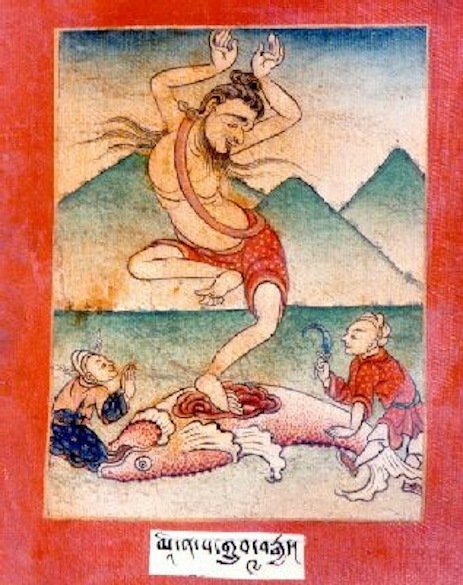 (paripurna: complete, entire matsyendra: founder of hatha yoga asana: pose). Let’s not get freaked out yet! There are lots of postures imbedded in this single pose and that’s our work for the week. The way I see it, there has to be strong work to get the upper back to move in, massive shoulder opening, supple hips, and tenacity. Ardha Matsyendrasana (half lord of the fishes pose) itself has multiple versions and angles one could take to get closer to this “complete” form. Also, there is a partner pose in the backbend category, Matsyasana (fish pose). Come prepared to twist but also see how working with other poses will take you as deep as you can go. How deep? Matsyendra was thrown into the ocean by his parents and swallowed by a fish. For many years he lived in the belly of a fish listening to the teachings of yoga transmitted from Siva to Parvati, the teachings he was preserving just for deserving ears. Matsyendra overhearing the teachings becomes an adept at Hatha Vidya and emerges to share the teaching of yoga with the world. We are going all the way back to the source of yoga posturing in this pose. That’s how deep. The story of Matsyendranath also points to what becomes of the abandoned, unwanted, intimidatingly powerful side of being? It inspires me to reflect on his being cast away leading to his rebirth as a pivital character possessing great knowledge that is meant to enlighten humanity. Perhaps our liabilities become our assets?